AMA Flat Track is about to get interesting. This is a copy and paste from another forum I belong to. For any of you race fans that are excited about the old H-D/Indian rivalry on the track reigniting, here it comes. "In 11 Days and 6 some odd hours the Indian FTR750 will make it's official AMA Pro Flat Track Race debut at the Santa Rosa Mile. We posted the press release a few days ago. This marks the first time that Indian Motorcycle has fielded a factory-backed racer in the Pro series since the 1950's. We are super excited to see Indian and Harley Davidson face off on the starting grid at the pro level and rekindle a feud on the level of the Hatfields & McCoys. Flat track racing is essentially the first action sport in the US. In the early years of motorcycling, factory-backed teams strove to edge out the competition on dirt tracks scratched out of fields and back lots. The History of Flat Track Racing has a long and speckled past. From a literal grass-roots start, to nearly going bust during the World Wars, the AMA has seen manufacturers come and go. For years, the title was consistently held by the Harley Davidson, as they were among the few manufacturers that could consistently field machines. When the British could no longer send their Triumphs and BSA's over, and when Indian and Harley switched gears to help the war effort, Harley was able to stay afloat after the war ended and GI's came home looking for the machines that they came to love. Here we are all these years later, and we are on the cusp of the next generation of rivalry between these two storied companies. If you have read the Indian FTR750 Specs, then you know that the machine that Indian is bringing to this gun fight is going to be formidable against Harley's XR750. Both machines are race-specific rockets that are designed specifically to turn left and do it with great haste. Neither is legal for the street and both are built and tuned by the best in the business. All year, the Harley XR750 has been taking home a podium finish on the longer mile and half-mile races. The competition has been stout as well. Companies with huge racing credentials have been vying for the podium. Ducati has fielded a flat track machine modeled after their wildly popular Scrambler, but with a huge HyperMotard motor stuffed into it. Triumph has been competitive with their Bonneville, and Yamaha has made some waves with their FZ07 machine. However, it has been the Kawasaki Ninja 650 that has posed the biggest threat to Harley so far this season, taking the top spot on the podium at the Arizona Mile and the Sacramento Mile. However, Harley was able to take virtually every event during this season of Flat Track racing with Jared Mees taking 9 podium finishes for Harley. You might recognize that name, Jared Mees, as he is one of the test riders that Indian used to develop the Indian FTR750. It will be interesting to see what comes of that, as I am sure that Mees will bring what he learned with Indian to his team at Harley. One can only hope that Indian left a little to the imagination when working with Mees. Indian will have Joe Kopp sitting on the FTR750 in Santa Rosa. Kopp is an accomplished rider that is one of just 15 riders to have completed the dirt track "Grand Slam." This means that he has victories on short track, TT, half-mile, and mile courses. Among his long list of accolades, he is a championship level racer on dirt track, Pro Supermoto, V&H XR1200 Challenge, as well as a Pikes Peak International Hill Climb podium finisher. While Mees will be taking information to his team, Kopp has a fair amount of experience with Harley. I am looking forward to seeing what the FTR750 will do at the last AMA Flat Track race of the season. It is wise for Indian to field during the last race so that they can get a clear baseline for their off-season development and prep for the 2017 AMA season. The races will be streamed on FanChoice.tv for you to watch on Sunday 25th September at the Ramspur Winery Santa Rosa Mile. 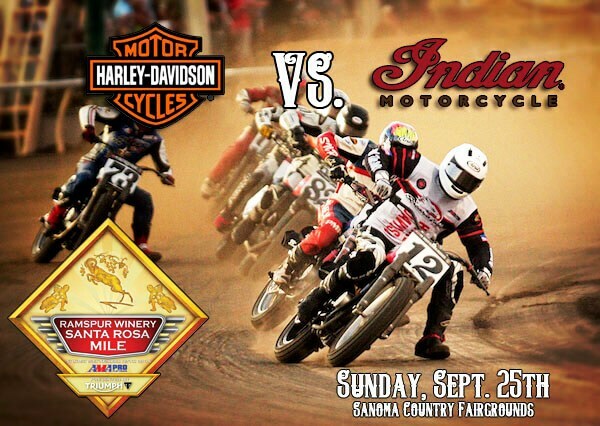 On Saturday, Indian will be sponsoring yet another RSD Hooligan Race in Santa Rosa as well. I plan on tuning in, and I hope you do as well. For Tickets and Information, click here: Ramspur Winery Santa Rosa Mile AMA Pro Flat Track Race : September 23-25 2016"
The author has requested that I post a link to the Original post on the Indian site. As requested I will comply. sweet! It will be nice to see the rivalry again! I know as a long time Harley and now Indian rider with a lot of Harley friends, I am as well. starting in just a few minutes at 1300 hrs eastern time. This should help to determine if it's the machine, or the riders. We are just a few days away from the Lone Star Half-Mile here in the great state of Texas, and like the saying goes, "Everything is Bigger in Texas." Well, this time it will be the Indian FTR750 that will be on trial to see if it is the men of the Wrecking Crew that have put Indian on top, or the machine? This weekend will be the first time that a privateer will be running the Indian FTR750 in an event. Johnny Lewis, a rider that has seen his fair share of good and bad luck over the last few years, will be riding a privately-owned FTR750 in Fort Worth this coming weekend. We have seen the Indian in the hands of Joe Kopp last year during the public test and unveiling of the FTR750 last year at Santa Rosa, and then last week in the pages of Cycle World with Aaron Colton at the bars. Other than that, we have really only seen the boys of the Wrecking Crew battling it out. Perhaps it is due to the rather large purchase price of the FTR750of $45,000-50,000, but there have only been three FTR750's on the starting line despite the dominance over the 2017 AFT season. This weekend will mark the first time that a fourth will be in the mix. If you are unfamiliar with the Johnny Lewis name, he has been racing professionally for 11 years now. He started his professional career at 16 in AMA Supermoto, racing for the KTM Factory Team, and had great success. Then in 2009, he trained his sights on Flat Track where he has won several races, podiumed even more, and has piloted the Lloyd Brothers Ducati Scrambler in the X-Games as well as many others. His "day job" is 10 Training where he runs rider camps for racers and the general public to hone their 2-wheel skills. Not a bad gig if you are asking me. His race-proven record has him high on the list of test subjects to show what the FTR750 is all about, and in a few days we will see if it really is the FTR750 or the riders themselves that are putting Indian on the podium week after week.Should be fun to watch! Last edited by Atitagain; 01-03-2019 at 02:13 PM. To OP: Pretty irrelevant to original 2016 thread. You might want to put this in the Softail section. OK, doesn't matter. Deleted it. Flat Track 2017 - Root for HD or Indian? Any Ventura County, CA Riders? Quick Reply: AMA Flat Track is about to get interesting.